Below you can find a list of publications by CARMAH researchers which can, for the most part, be downloaded either as a pdf or via an external link. Please note that some external links may require you to register access via the providing platform. Katarzyna Puzon (forthcoming), in Eszter Gantner and Heike Oevermann (eds) Securing Urban Heritage: Agents, Access, and Securitization. London: Routledge. Alice von Bieberstein, Corinna Trogisch and Steffen Käthner (2019), in: Forum Wissenschaft 19(1): 24-31. Sharon Macdonald & Jan-Jonathan Bock (2019) eds., Refugees Welcome? 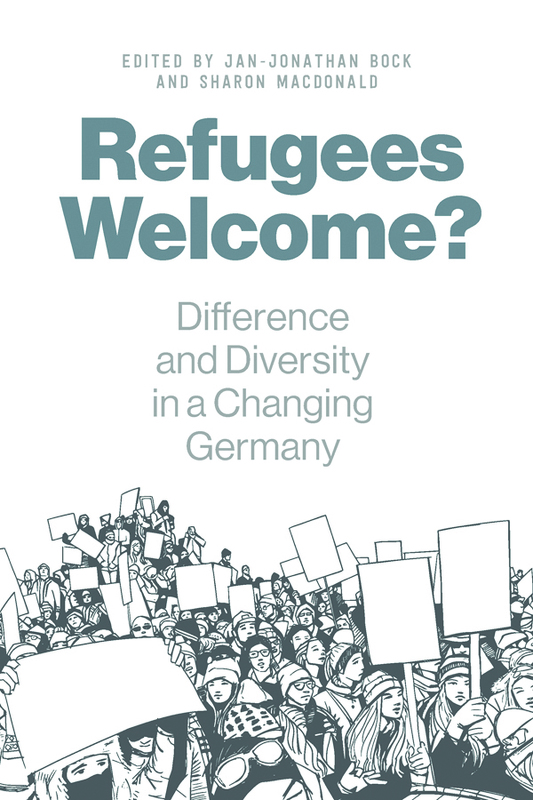 Difference and Diversity in a Changing Germany, Oxford: Berghahn. in: Bock, Jan-Jonathan and Sharon Macdonald. (eds) Refugees Welcome? Differences and Diversity in a Changing Germany. Oxford/New York: Berghahn Books, pp. 241–264. Larissa Förster, Dag Henrichsen, Holger Stoecker and Hans Axasi Eichab (forthcoming), in: Human Remains and Violence 4/2. Margareta von Oswald, in: Blog - Wie weiter mit Humboldts Erbe? Ethnographische Sammlungen neu denken. Nadim, T. and Wagner, N. (eds.) 2018. The Influencing Machine. Berlin: nGbK. ISBN 978-3-938515-74-7. 320 pages. Nadim, T. 2018. Introduction: The Influencing Machine. In Nadim, T. and Wagner, N. The Influencing Machine. Berlin: nGbK. Harald Fredheim, Sharon Macdonald and Jennie Morgan (2018). York: University of York. Sharon Macdonald and Jennie Morgan (2018), in Philipp Schorch and Conal McCarthy (eds. ): Curatopia. Museums and the Future of Curatorship. Manchester: Manchester University Press. Larissa Förster and Friedrich von Bose (2018), in: Philipp Schorch and Conal McCarthy (eds. ): Curatopia. Museums and the Future of Curatorship. Manchester: Manchester University Press. Sarah Fründt and Larissa Förster (2018), in: Zeller, Joachim; Bechhaus-Gerst, Marianne (eds.) Deutschland postkolonial? Die Gegenwart der imperialen Vergangenheit. Berlin: Metropol-Verlag. in: Breed, Ananda and Tim Prentki. (eds) Performance and Civic Engagement. Basingstoke: Palgrave, pp. 269-300. Sharon Macdonald, Christine Gerbich and Margareta von Oswald (2018), in: Museum and Society. Larissa Förster, Iris Edenheiser & Sarah Fründt, translation of the introduction to the volume "Provenienzforschung zu ethnografischen Sammlungen der Kolonialzeit" (2018), provided through the Research Centre for Material Culture, Leiden. Larissa Förster, translation of the introduction to thematic block 5 of the edited volume "Provenienzforschung zu ethnografischen Sammlungen der Kolonialzeit" (2018), provided through the Research Centre for Material Culture, Leiden. Larissa Förster & Sarah Fründt (eds.) (2018), with contributions by E. Ayau, D. Gabler, T.H. Herewini, H. Keeler, K. Kepplinger, R. Leipold, M. Pickering, D. Preuß, C. Rassool, K. Schramm, H. Stoecker & A. Winkelmann. Katarzyna Puzon (2018), in: Journal of the Royal Anthropological Institute 24(3): 649-650. Margareta von Oswald, Felicity Bodenstein & Callum Fisher (2018): A report from the three-day workshop 'Exchanging perspectives: anthropologies, museum collections and colonial legacies between Paris and Berlin' (June 6-8, 2018) held at CARMAH and at the Haus der Kulturen der Welt. In: Blog - Wie weiter mit Humboldts Erbe? Ethnographische Sammlungen neu denken. 'Capacity for Character: Fiction, Ethics, and the Anthropology of Conduct'. ​Social Anthropology/Anthropologie Sociale 26 (3): 345-360. Duane Jethro (2018) in: International Journal of Heritage Studies. Published online. Duane Jethro (2018) in: Meyer, Birgit and Mattijs van de Port (eds. ): Sense and Essence - Heritage and the Cultural Production of the Real. Oxford: Berghahn Books, 136-157. Nadim, T. 2018. Friends with books. In Moore, S. (ed.) The Commons and Care. Manchester: Mattering Press. pp 26-33. Sharon Macdonald (2018), in H.Callan (ed.) Encyclopaedia of Anthropology, Wiley-Blackwell. How can we know the future? Uncertainty, transformation, and magical techniques of significance assessment in museum collecting. Sharon Macdonald & Jennie Morgan (2018), in Regine Falkenberg, Thomas Jander (eds.) 'Assessment of Significance.' Berlin: Deutsches Historisches Museum, pp. 20 - 26. Nadim, T. 2018. Haunting seedy connections. In Lury, C., Fensham, R., Heller-Nicholas, A., Lammes, S., Last, A., Michael, M. and Uprichard, E. (eds.) Routledge Handbook of Interdisciplinary Research Methods, Abingdon and New York: Routledge. pp 239-247. Larissa Förster, Iris Edenheiser, Sarah Fründt and Heike Hartmann (eds.) (2018), E-book, published on the e-doc-server of Humboldt-Universität zu Berlin. Larissa Förster (2018), in: Larissa Förster, Iris Edenheiser, Sarah Fründt and Heike Hartmann (eds. ): Provenienzforschung zu ethnologischen Sammlungen der Kolonialzeit, published on the e-doc-server of Humboldt-Universität zu Berlin. Jonas Tinius (2018), in: Fillitz, Thomas and Paul van der Grijp (eds. ): An Anthropology of Contemporary Art: Practices, Markets, and Collectors. London: Bloomsbury, pp. 130–145. In: Brandstetter, Anna-Maria and Vera Hierholzer (eds.) (2018): Nicht nur Raubkunst! Sensible Dinge in Museen und universitären Sammlungen. Mainz University Press: 293-318. Jonas Tinius and Johannes Lenhard (2017), in: King’s Review (1): 90–102. Katarzyna Puzon (2017), in: International Journal of Heritage Studies. Sharon Macdonald and Jennie Morgan (2017), Collections Trust Website. Duane Jethro (2017) in: Mille, Kim and Brenda Schmahmann (eds. ): Bronze Warriors and Plastic Presidents - Public Art in South Africa. Bloomington: Indiana University Press, 166-192. Jonas Tinius (2017), in: Mousse Magazine. With Kirstine Roeppstorff and Solvej Helweg Ovesen. Duane Jethro (2017) in: Johnson, Greg and Siv Ellen Kraft (eds. ): Handbook of Indigenous Religions. Brill: Leiden, 349-365. Introduction. Engaging anthropological legacies toward cosmo-optimistic futures? Sharon Macdonald, Henrietta Lidchi and Margareta von Oswald (2017), in Museum Worlds: Advances in Research 5: 97-109. Henrietta Lidchi, Sharon Macdonald & Margareta von Oswald (eds.) (2017), special section of Museum Worlds: Advances in Research 5. Margareta von Oswald & Verena Rodatus (2017), in Museum Worlds: Advances in Research 5: 211–223. Jonas Tinius (2017), in: World Art 7(2): 227-251. Wayne Modest, Margareta von Oswald and Bonaventure Soh Bejeng Ndikung(2017), in: L'Internationale Online (ed. ): Thread 'Decolonising Practices'. Sharon Macdonald (2017), in: Stuhl, Frauke, Horst Bredekamp und Wolfgang Schäffner (eds. ): +ultra. gestaltung schafft wissen. Dokumentation der Ausstellung und ihrer partizipativen Vermittlungsformate. Berlin: Waxmann, pp. 67-70. Larissa Förster and Sarah Fründt (2017), in: H-Soz-Kult Forum. Jonas Tinius (2017), in: Matthias Warstat et al. (eds. ): Applied Theatre – Frames and Positions. Berlin: Theater der Zeit, pp. 205–235. Sharon Macdonald (2017), in: Iphofen, Ron (ed. ): Finding Common Ground. Consensus in Research Ethics Across the Social Sciences. London: Emerald Publishing Limited. pp. 29-35. Sharon Macdonald (2016), in: Commandeur, Beatrix, Hannelore Kunz-Ott and Karin Schad (eds. ): Handbuch Museumspädagogik. Kulturelle Bildung in Museen. Munich: Kopaed. pp. 95-105. Katarzyna Puzon (2016), in: Anthropology of History Yearbook, Volume 6, Issue 9, pp. 109-122. Harrison, R., N. Bartolini, C. DeSilvey, C. Holtorf, A. Lyons, Macdonald, S., Morgan, J. and S. Penrose (2016), in: Archaeology International, No. 19: pp. 68-72. Sharon Macdonald (2016): Heritage Futures Website. Jonas Tinius (2016), in: Rustamova, Gyunel (ed. ): Art as a Medium for Action. Exhibition catalogue, curated by Cinthia Willaman. London: Langham Press, pp. 4–6. Sharon Macdonald and Regina Römhild (2016), in: Traces Fanzine #1. pp. 10-12. Duane Jethro (2016): Review Symposium - Responses to Birgit Meyer's Sensational Movies: Video, Vision and Christianity in Ghana. In: Religion, 46(4): 662-668. Sharon Macdonald (2016), in: Museum International, Volume 67, Issue 1-4, pp. 6-22. Katarzyna Puzon (2016), in: O'Rawe, D. and M. Phelan (eds. ): Post-Conflict Performance, Film and Visual Arts: Cities of Memory. Contemporary Performance InterActions. London: Palgrave Macmillan, pp. 265-83. Sharon Macdonald and Jennie Morgan (2016): Heritage Futures Website. Larissa Förster (2016) in: Schulze, Sabine und Silke Reuther (eds. ): Raubkunst? Silber aus ehemals jüdischem Besitz – wie gehen Museen damit um? Tagungsband zum Symposium anlässlich der Ausstellung „Raubkunst? Provenienzforschung zu den Sammlungen des Museums für Kunst und Gewerbe Hamburg. 42-45. Larissa Förster und Holger Stoecker (eds.) (2016): Band 9, Laborberichte. Weimar: VDG. Jonas Tinius (2016), in: Journal of the Royal Anthropological Institute, 22: pp. 215-216. Margareta von Oswald and Anna Seiderer (2016). in: Contemporary And. Plea for a more systematic, comparative, international and long-term approach to restitution, provenance research and the historiography of collections. Larissa Förster (2016), in: Museumskunde, Vol. 81, pp. 49-54. Sharon Macdonald (2016), in: Murphy, Bernice L. (ed. ),: Museums, Ethics and Cultural Heritage. London: Routledge (ICOM publication), pp. 267-77. Sharon Macdonald (2016), in: Museum Anthropology, 39 (1): pp. 4-19. Sharon Macdonald (2016), in: Poli-Politique de l’Image, No. 12: pp. 50-59. Sharon Macdonald (2016), in: Journal of the Royal Anthropological Institute, 22: pp. 237-8. Jonas Tinius (2016), in: Journal of Art and Anthropology / Cadernos de Arte e Antropologia. 5 (1): pp. 21-38. Duane Jethro (2015) in: Tourist Studies. Special Issue 'Tourist and Local', edited by Stefanie Schaefer and Dean MacCannell, Vol. 16(4): 446-461. Sharon Macdonald (2015), in: Forum Rethinking Euro-Anthropology. Social Anthropology 23: 4. Sharon Macdonald (2015), in: Journal of the Royal Anthropological Institute, 21: pp. 485-6. Sharon Macdonald (2015), in: Prinzip Labor. Berlin: Humboldt-Lab Dahlem. Sharon Macdonald and Helen Rees Leahy (general eds.) (2015): Four volumes. Museum Theory, Museum Practice, Museum Media and Museum Transformations. New York: Wiley-Blackwell. Sharon Macdonald (2015), in: Braun, Karl, Dieterich, Claus-Marco and Angela Treiber (eds. ): Materialisierung von Kultur: Diskurse, Dinge, Praktiken. Würzburg: Königshausen & Neumann Verlag. Sharon Macdonald (2015): Heritage Futures Website.